When I first started working at JLA I had spent the last three years living between the USA and Japan. As a result, so many of the speakers we regularly work with were unknown to me at first. Figures from sport, television, politics and media from the UK were mostly new to me. I admit I first went through the JLA index (our catalogue of speakers which we send out every year) in the attempt of spotting as many familiar names and faces as possible, to end up only really recognising the celebrity speakers. When it comes to booking celebrity speakers JLA knows a thing or two. We have regularly booked stars like Joanna Lumley, James Corden, David Walliams and Stephen Mangan for our events. Many enquiries that come to JLA for celebrity speakers look for that “big name” or “big draw”, which can mean different things to different people, in different industries. However, when it came to booking Nicole Scherzinger for the London Boat Show, there was no doubt she was a big name that anyone would recognise. Nicole has led the Pussycat Dolls to global stardom with 54 million albums sold, she has had a hit solo career, has made appearances on the UK and US versions of X-Factor as a judge and is currently starring in the West End revival of Cats as Grizabella. Nicole it seems, has some stellar staying power. At our event at the ExCel in London, Nicole shone amongst the flashbulbs as she spoke to the crowd and cut the ribbon unveiling the new Sunseeker Predator 57. 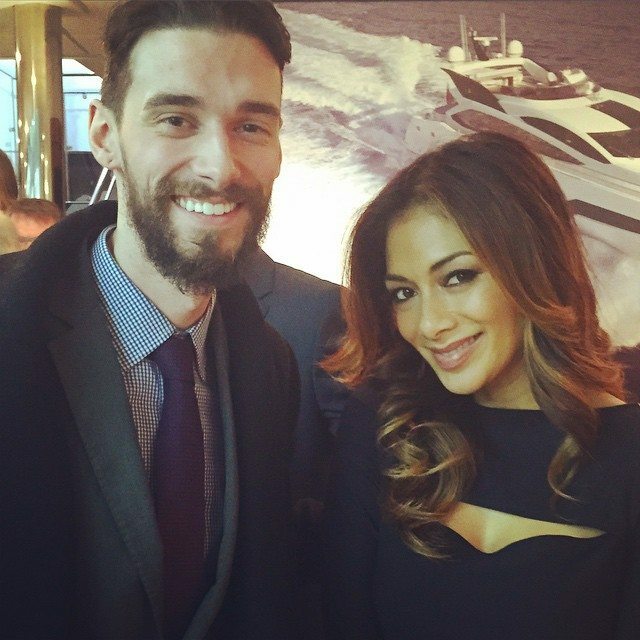 After she officially opened the London Boat Show, I met Ms. Scherzinger backstage. She warmly shook my hand, asked how I was doing and even posed for a picture.After sending that picture to my mum, who doesn’t quite understand what I do, she’s taken to telling friends and neighbours I “work with the lady from X-Factor”. Now that’s a pretty gross misrepresentation of my job! Within a day of the event the Google search engine was showing 2.3 million results, Nicole’s appearance was featured in dozens of newspapers and blogs and more than a few Nicole fans retweeted our picture of Nicole on the @JLALive account. Not many other celebrity speakers make appearances that can boast that kind of exposure! If you need celebrity speakers, just get in touch. With our years of experience we know who has that “big draw”.